She says she’s thinking about the rumaki….oh yes…the rumaki…mmmmm…. Focus Party Princess, you’re getting sidetracked. 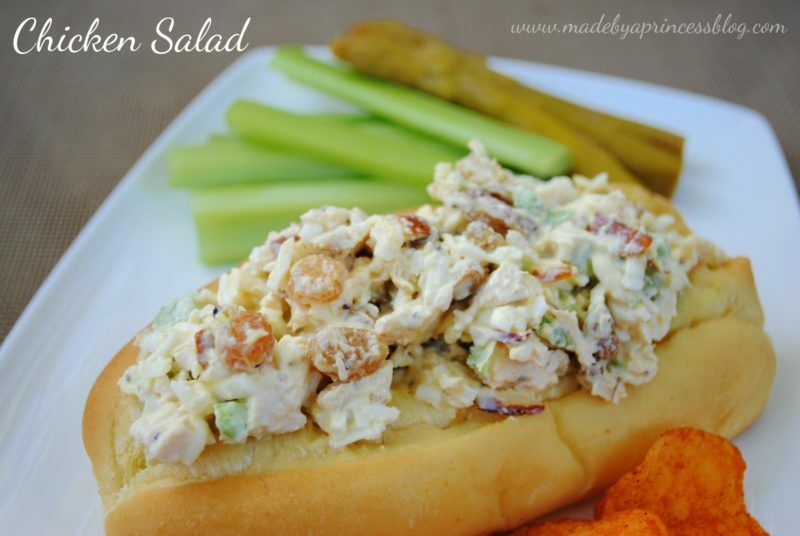 Ok, soooo the chicken salad. This is not my original recipe. A very good friend of the family made this for my baby shower last year and I loved it. I think I had three helpings. And then another one when I got home. It is really really good. Not too sweet but just sweet enough to satisfy that nagging little sugar tooth I have. I asked her for the recipe and she (thankfully) shared. Thank you Ginny! I made this for Miss Cupcake’s Christening and every bit was gone. That seems to be a recurring theme with food at my parties… After sending the recipe to my friend I decided I needed to make it too so this was my dinner the next night. Chicken salad sandwich, celery sticks, BBQ Kettle chips, and pickled spicy asparagus that my friend Jen had sent (in a huge basket of goodies) as a thank you for sharing Miss Cupcake’s clothes with her own little angel. I now need to find a pickled spicy asparagus recipe because these are all gone and I need more. Jen, you have no idea what you started here! Put the chopped chicken, shredded eggs, diced celery, and plump raisins in a medium bowl. Mix lemon juice and mayonnaise together and add to bowl of chicken, etc… and incorporate well. Add salt and pepper to taste. Mix in almonds. Best served cold. Serve on lettuce, bread, or my favorite, Hawaiian rolls. Notes from Ginny: Buy the chicken at Smart & Final and cut off the breasts with the skin. Boil in large pot, cook the chicken, skin, and dice. If you don’t have a Salad Shooter, shred the eggs through a hand shredder. If you don’t have a hand shredder finely chop. This is a picture I took of the lemon curd and dark chocolate chip filled raspberries at my friend Marisa’s house.